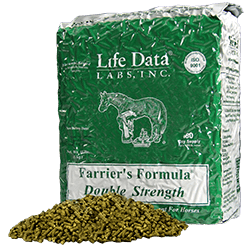 Farrier's Formula®Double Strength is a pelleted hoof supplement that can be added as a top dressing on the regular feed or given separately. It provides nutrients such as phospholipids, omega fatty acids, vitamins, minerals, and important amino acid “protein building blocks” for a healthy hoof and hair coat. These nutrients are provided at twice the concentration compared to original Farrier's Formula®. Over 30 years of research, clinical trials and field testing validate the effectiveness of Farrier's Formula®. Weak hoof structure leads to hoof wall problems such as quarter cracks, toe cracks, sand cracks, brittle hoof walls and hoof wall separation. These hoof wall defects often create an environment ideal for the microbial invasions associated with white line disease and crumbling horn. Also addressed are horses with thin soft soles that are susceptible to sudden lameness from bruising, and horses recovering from laminitis or founder whose cohesive bond between the outer hoof wall and the coffin bone has been damaged. Farrier’s Formula® supplies the nutrients required for building strong hoof capsule connective tissue in the correct balance and ratio. It also promotes strong and fast growth of the hoof wall, sole, frog, and heel. Farrier’s Formula® provides proper nutrition to “grow out” wall cracks, strengthen and thicken the hoof wall and sole, reduce the likelihood of microbial invasions and bruising, and assist with laminitis recovery. Farrier’s Formula® also promotes a glossy more deeply colored coat and strengthened connective tissues of the joints and ligaments. • A 60 day supply for a 1000 lb horse at the Adult Replenishment Feeding Level or a 120 day supply when feeding at the Adult Maintenance Feeding Level. Farrier's Formula®Double Strength is doping free and can be fed to competition horses. 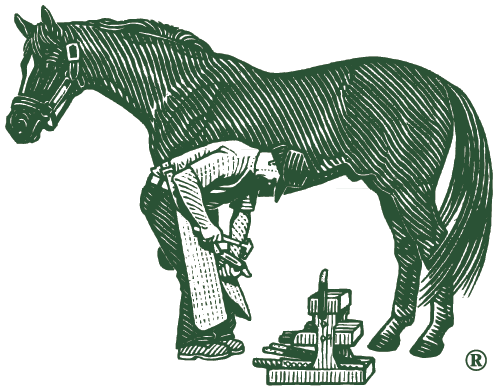 Farrier's Formula®Double Strength does not contain added cobalt. Farrier's Formula®Double Strength is available in 11 lb nitrogen flushed vacuum bags or 11 lb nitrogen flushed buckets.